datacenterHawk - Simple Search. Powerful Results. Search now for the most accurate, up to date data center market information. We are a convenient "one-stop-shop" for IT professionals, consultants, data center operators and investors to find data center and cloud solutions. The complex process of searching and analyzing colocation and cloud service providers has never been easier with our robust toolset. Set strategy. Find Solutions. Analyze Options. Gather data, evaluate options, and make decisions faster than ever before. Every data point is reviewed, analyzed and approved before it goes live. Access the latest colocation lease comp data and data center acquisition information on one platform. 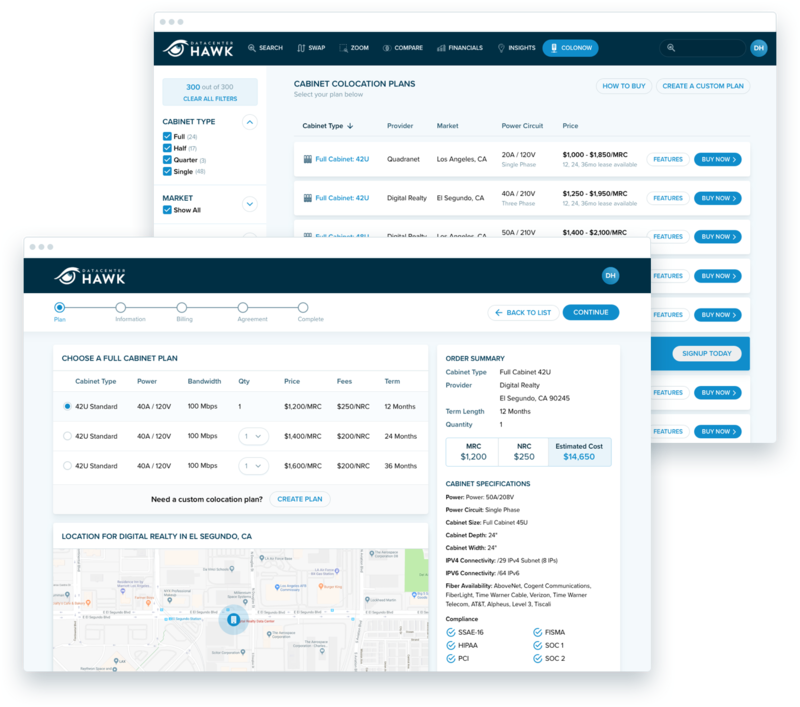 Hawk Search enables you to quickly discover data center locations by market, provider and availability. Our advanced search functions give you the power to dig deeper and evaluate the strategic options of colocation or cloud solutions. Validating a data center transaction has never been easier. 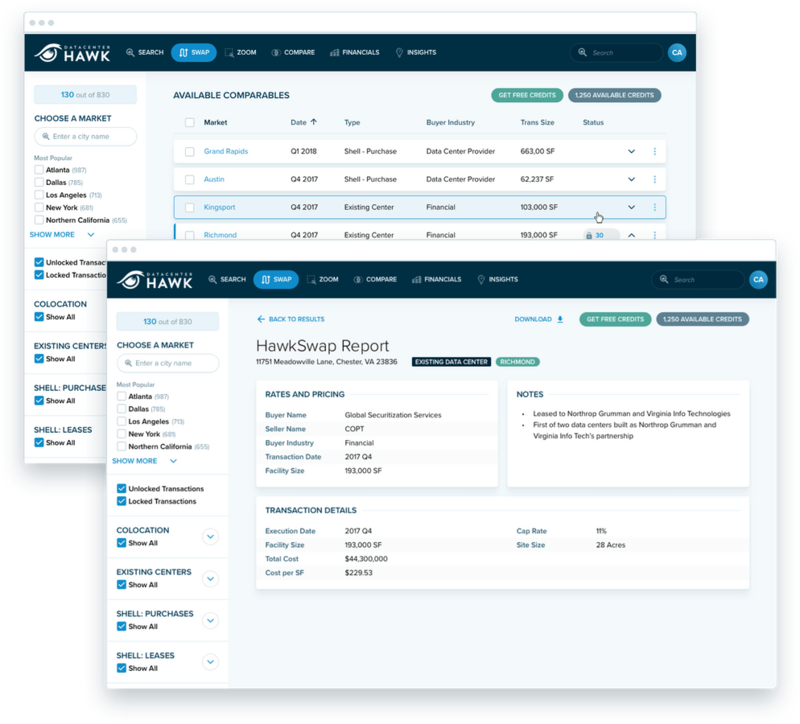 Hawk Swap is the data center industry's leading transactional exchange platform designed to help you get the info you need, when you need it. We track the top North American data center markets with real time data and provide in-depth analysis on market trends and activity. 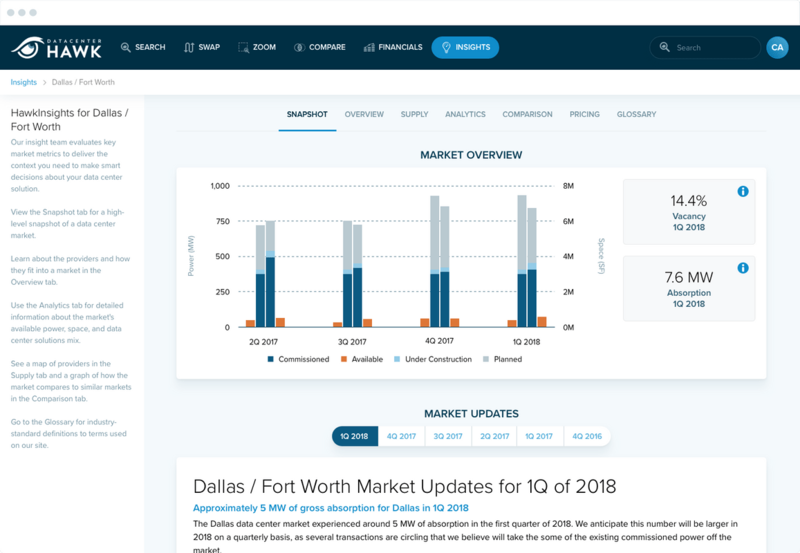 Hawk Insight provides access to complete quarterly market overviews, with updates on market vacancy, absorption and pricing. Lease colocation cabinets today with the colocation provider of your choice through datacenterHawk’s ColoNOW. ColoNOW’s 4 Step Process allows you to identify your requirement size, choose your data center provider/facility, agree on your price and sign your MSA/SLA. It’s an easy process that you can complete today. Take search a step further with seamless and smooth comparisons. Simply drag search results into your cue and compare chosen providers. 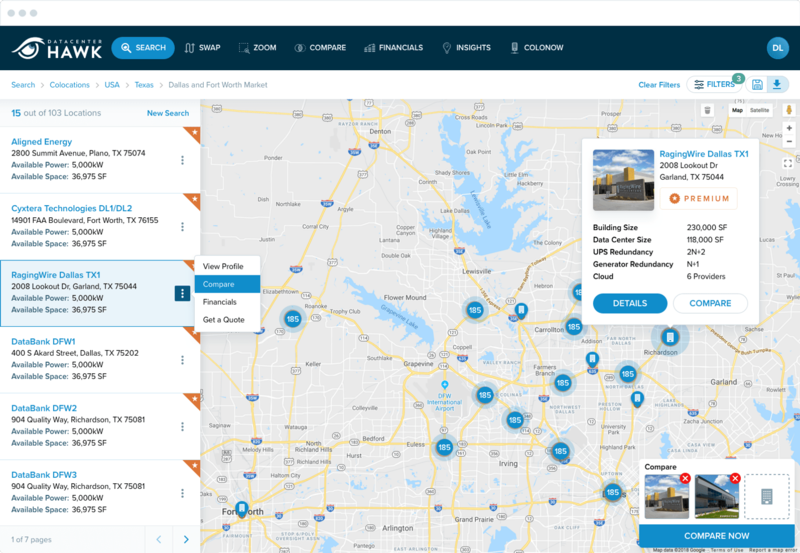 Hawk Zoom allows you to quickly locate markets suitable for your data center requirement by evaluating cities with key criteria tailored to what matters most for your company. Hawk Financials clarifies the cost of data center infrastructure. Use it today to create the right strategy for your company’s data center decision. Please log in with original device. If issues continue, contact datacenterHawk. Click here to reset your registered devices. Email sent. Check your email for a link to reset your devices.